Charles S. Roberts created the first board wargame for the mass market, Tactics, in an apartment in Catonsville, Maryland in 1952. In 1954, out of a garage in Avalon, Maryland, he began selling it via mail-order as The Avalon Game Company, and Roberts formed Avalon Hill in 1958 to publish Tactics II (1958), the newest incarnation of his wargame. Tactics II improved on the basic game design of his earlier effort, and formed the genesis for the concept of the combat results table. 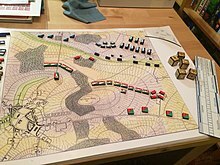 In 1958 he published Gettysburg, considered to be the first board wargame based upon an actual historical battle, with subsequent versions in 1961 and 1964. Hard hit by a recession, Roberts turned over Avalon Hill to one of his creditors, Eric Dott of Monarch Services, in December 1963. Tom Shaw, an old friend of Roberts and the only person to stay on from the original company, oversaw the company's successful period from 1963-1982. Starting in 1988, Roberts' name was given to the Charles S. Roberts Awards, given for excellence in the historical wargaming hobby. He was a charter member of the Charles Roberts Awards Hall of Fame. In 1999 Pyramid magazine named Charles S. Roberts as one of The Millennium's Most Influential Persons "at least in the realm of adventure gaming." Following the sale of his wargame company, Avalon Hill, Charles Roberts held various positions in the publishing industry. In 1973, he founded a small press, Barnard, Roberts, and Company, which he has described as "publishing to the Catholic market", even though Roberts himself is non-Catholic. Over time, the company's emphasis shifted away from religious publications and toward railroad history. Roberts took pride in coming from a long line of railroaders. One of his great great uncles was Thomas Swann, president of the Baltimore and Ohio Railroad from 1848 to 1853. Roberts' father and grandfather (also named Charles Swann Roberts) had long careers with the Baltimore and Ohio. In one of his books, Roberts reminisced about childhood trips with his father to observe the operations of the Pennsylvania Railroad, of which Roberts had always been an enthusiast. The firm of Barnard, Roberts, and Company published numerous books about railroad history, many written by Charles Roberts himself. Earlier volumes focused on the Baltimore and Ohio, and later books documented the Pennsylvania Railroad. The first in this series was Triumph I: Altoona to Pitcairn: 1846-1996, and the last was Triumph IX: Salt Sea to Bays, Valleys, Dells, and Firestorms: 1927-2007. In Triumph IX, Roberts includes reminiscences about his life and movingly pays tribute to his late first wife, Patricia. ^ "United States Social Security Death Index," index, FamilySearch (https://familysearch.org/pal:/MM9.1.1/VM8R-W2V : accessed 17 Feb. 2013), Charles S Roberts, 20 August 2010; citing U.S. Social Security Administration, Death Master File, database (Alexandria, Virginia: National Technical Information Service, ongoing). ^ "Charles S. Roberts". Baltimore Sun. August 23, 2010. ^ Rasmussen, Frederick N. (August 28, 2010). "Charles S. Roberts, train line expert, dies at 80". Baltimore Sun. ^ a b c d Shannon Appelcline (2011). Designers & Dragons. Mongoose Publishing. p. 175. ISBN 978-1-907702-58-7. ^ Zocci, Lou (2007). "Gettysburg". In Lowder, James (ed.). Hobby Games: The 100 Best. Seattle, WA: Green Ronin Publishing. pp. 130–133. ISBN 1-932442-96-0. ^ Haring, Scott D. (1999-12-24). "Second Sight: The Millennium's Best "Other" Game and The Millennium's Most Influential Person". Pyramid (online). Retrieved 2008-02-15. ^ Roberts, Charles S. (1983). "Charles S. Roberts: In His Own Words". Archived from the original on 2008-10-06. Retrieved 2008-08-09. ^ a b c Roberts, Charles S. (1997). Triumph I: Altoona to Pitcairn: 1846-1996. Baltimore, Maryland: Barnard, Roberts, and Co., Inc. ISBN 0-934118-23-X. ^ a b Roberts, Charles S. (2009). Triumph IX: Salt Sea to Bays, Valleys, Dells, and Firestorms: 1927-2007. Baltimore, Maryland: Barnard, Roberts, and Co., Inc. ISBN 0-934118-31-0. Charles S. Roberts: The Founding Father, biography. Barnard, Roberts, and Company, Inc. This page was last edited on 11 December 2018, at 17:15 (UTC).